With Smartpay, depending on your terminal, you can be set up with Smartlink or SmartConnect. If you are using SmartConnect - this article is not the one. Head on over here. Once you integrate the device with the posBoss till app, it is locked down so that every Eftpos transaction must go through posBoss. You cannot use it separately. Please Note: We highly recommend having a dedicated network, solely for posBoss and Smartpay if you are setting up integrated eftpos. Other devices joining the network can cause communication issues. 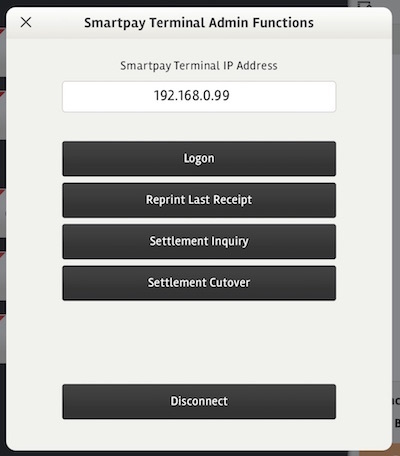 Locate the IP address from your Eftpos terminal and enter the IP address of the Eftpos terminal into the field at the top called Smartpay Terminal IP Address, replacing the default text. Test by pressing Logon. The terminal will run it's test and should then print out a success message. PosBoss and Smartpay aren't talking? Click here.